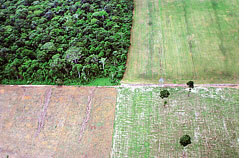 Brazil is losing its Amazonian forests to farmers at an unprecedented rate, latest satellite observations have shown. The destruction has so alarmed the Brazilian government that it called an emergency meeting in the last week of January, attended by the president, Lula da Silva. Only six months ago Brazil touted preliminary satellite figures that showed the lowest forest loss since 1970s, with only 960,000 hectares (ha) being cleared in 12 months up to July 2007. But the latest satellite observations show the rate of loss has jumped in the second half of 2007, reversing the downward trend. Though the government is yet to release the report details, environmentalists say figures will likely show that more than 700,000 ha of Amazon rainforest were destroyed between August and the end of December 2007. Soon after the meeting, Brazilian president said research is underway to confirm the figures and ordered the deployment of extra police and environmental agents to monitor illegal logging in 36 high-risk municipalities. "We have never before detected such a high deforestation rate at this time of year," said environment minister Marina Silva, who blamed high food prices, with farmers treating the rainforest as cheaply available land. Meanwhile, two Brazilian research groups have come out with their studies showing that the rainforests will shrink by 20 per cent by 2030 as farming, road construction and poor government surveillance speeds deforestation.